About 18 months ago we started out with 330,000 tiny clam babies, and have been carefully growing them in the Boca Grande under the watchful eye of a professional clam farmer. Despite some normal losses during growing, and unanticipated losses from Hurricane Irma, we are the proud parents of 200,000 top-neck size clams! These clams take up about 300 bushels of space, and weigh in at about 20,000 lbs. – or 10 tons! And it’s a big job to get them from Boca Grande to Sarasota Bay and then onto boats and out on the water for release. 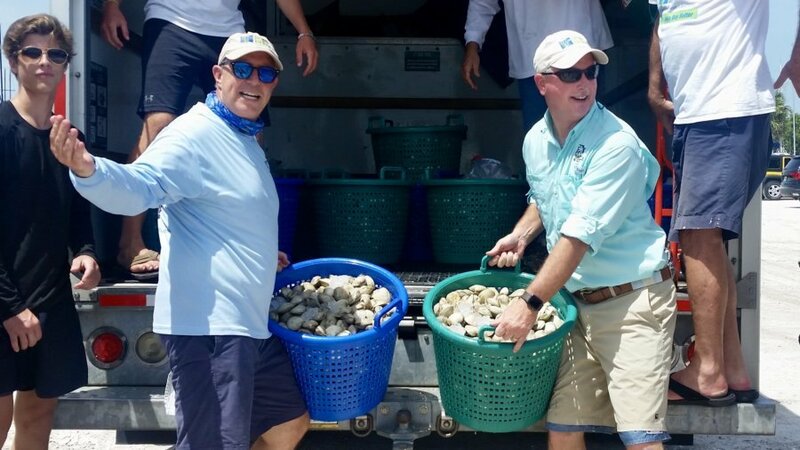 Yet we have loads of volunteers and boats who are eager to help – including Larry Begg’s, owner of Reef Innovations who provides a large work barge to carry the clams. Also we learn as we go and have streamlined the process since our first clam release in May. Sarasota Bay Watch got to show off the scale and efficiency our native clam restoration program to FWC Commissioner Mike Sole who, along with his wife Jeannie, joined us for a day to help with the clam reseeding effort. Commissioner Sole rolled up his sleeves, hauled bushels of clams and helped throw them overboard! It was a delight to have him along, and he was impressed with the strength and skill of our community-driven, volunteer-led effort. Also pitching in was Dr. Aaron Welch, a clam farmer, shellfish expert, and adjunct professor for the University of Miami. He was so impressed with our streamlined transportation and release process – particularly the fact that our clams are only out of the water for 4 hours – that he is confident that we will have 75% or greater survival rate, which is a tremendous accomplishment for our restoration program! Sarasota Bay Watch is particularly fortunate to have Mote Marine Laboratory as a scientific partner for this restoration program. Mote’s Senior Benthic Scientist Jim Culter and 7 of his associates were with us in their research vessels, as well as under the water – diving to help study the restoration process and investigate a wide range of experimental parameters with the clams on the sea bed. The Sarasota Sailing Squadron again graciously allowed us to use their facility as a base of operations and launch point. Our job is easy with great partners like Sarasota Sailing Squadron! Another great partner is Ed Chiles and his Mar Vista Restaurant & Dockside Pub, which hosted a special lunch for Commissioner Sole and area shellfish experts, including Dr. Bruce Barber, Executive Director of the Gulf Shellfish Institute and Eckerd College professor. Chef Eric prepared a 3 course meal of local sustainable seafood featuring blue crab, mullet and locally grown clams. It was a fabulous meal with lots of interesting discussion and exciting exploration of future collaborations.